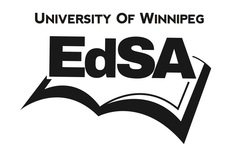 ​The Education Students’ Association (EdSA) represents the students of the Faculty of Education at the University of Winnipeg and serves their needs by providing social and professional development opportunities. EdSA strives to make every student’s experience in the Faculty of Education successful, positive, and rewarding. We work closely with the Faculty of Education and are recognized by the University of Winnipeg Students' Association (UWSA). Come visit the Education Students' Lounge (0GM10) and use the microwaves, comfy couches and chairs, and multiple workspaces. EdSA organizes the Graduation dinner and dance, edwear hoodie orders, and various Professional development opportunities including CHARGE - our very own PD day. See you in the Education Students' Lounge! Admission is FREE and snacks are available to purchase. There will be a 50/50 draw at 10:30 pm! Follow us on Facebook and Instagram to see what's going on in the Ed department! Header image from Flickr - ajbatac.